AFW is a registered Scottish Charitable Incorporated Organisation (SC014585), with the purpose of educating and enabling people in the North East of Scotland to take action to create a fairer world. AFW incorporates the Montgomery Development Education Centre (MDEC), which was set up in 1983 to focus on developing and delivering Global Citizenship Education within both the formal and non-formal education sectors. We have nine trustees currently and, whilst this provides an adequate complement of people with a good range of skills and interests, we wish to strengthen the team with a few more skilled, committed people who share our ethos of working together to create a fairer world. 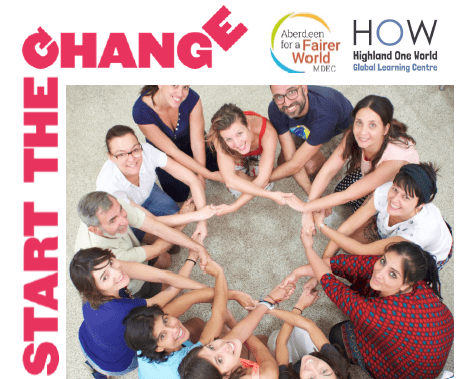 If you wish to be considered as a trustee for Aberdeen for a World, please email our Chair, Dr Nigel Dower, at afairerworld@btconnect.com, sending your CV and a covering note explaining your interest in our work. For two weeks each year, thousands of individuals, companies and groups across the UK come together to celebrate the people who grow our food, people who live in some of the poorest countries in the world and who are often exploited and badly paid. This year Fairtrade Fortnight is focusing on the people – in particular the women – who grow the cocoa in the chocolate we love so much. The theme is ‘She deserves a living income’. 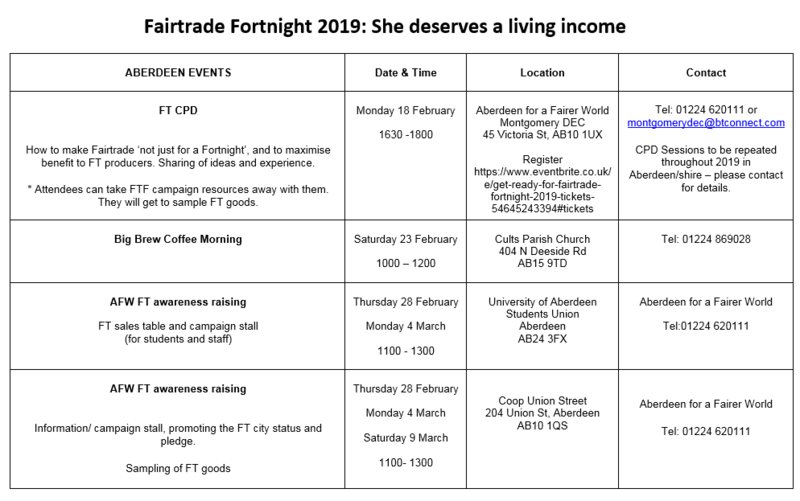 You can find more information and resources for Fairtrade Fortnight 2019 on the Fairtrade Foundation’s website. 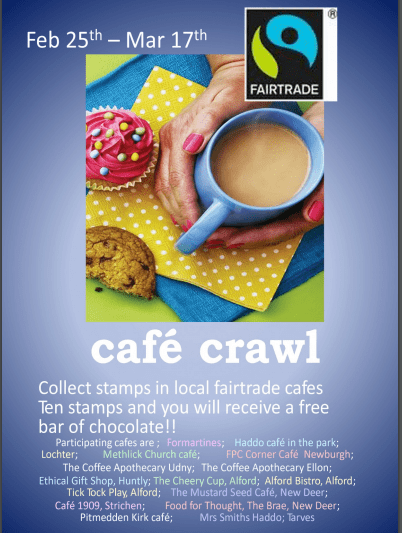 And if you’re out and about in Aberdeenshire during Fairtrade Fortnight, why not take part in this cafe crawl? 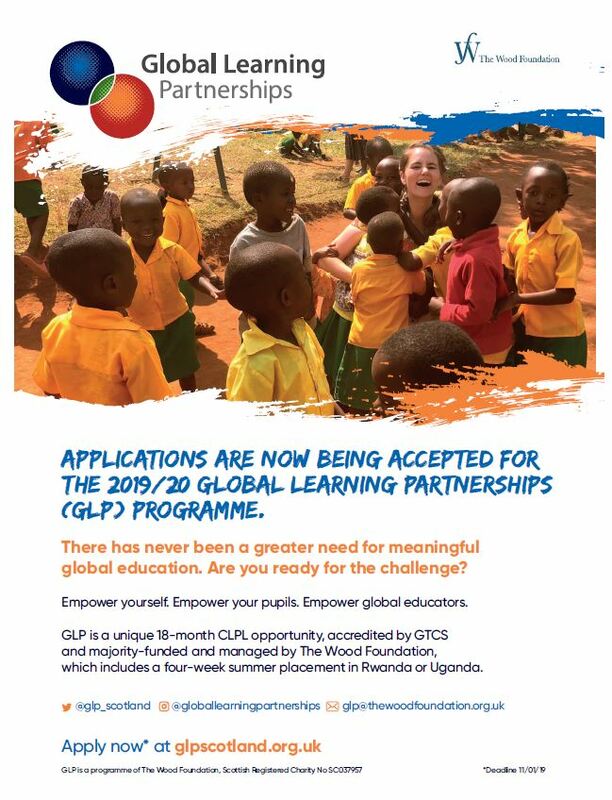 Our friends at the Wood Foundation are now looking for enthusiastic practitioners to join their Global Learning Partnerships 2019 Cohort. 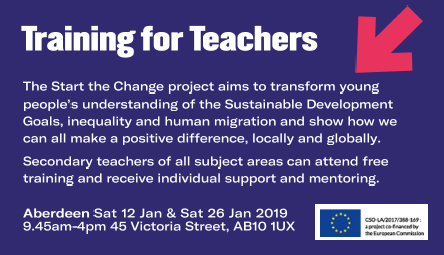 This is a great opportunity for teachers to take part in their month-long placement in Rwanda or Uganda, as well as two pre-departure sessions and one debrief. The application period is active from now until 11th January. Find more information regarding the application here. We hope you had a restful summer and are looking forward to working with you again this year. We are delighted to launch our CPD programme for the 2018-19 school session: MDEC CPD booklet 2018-19. Our sessions are provided free of charge and are focused on supporting you to link Global Learning to your classroom practice and across your school. You’ll see from the booklet that we have changed the format of our twilight sessions, in that we are now looking for schools to book and host a session and to help us to promote this amongst the network. We will manage the booking process and also promote outwith the school’s immediate area too. Our sessions can be tweaked and tailored, so please get in touch if there is something that you need that is not in the booklet. In addition, there are some other opportunities in the next few weeks that your teaching staff may be interested in. Aberdeen Science Centre and The Montgomery Development Education Centre invite teachers of STEM subjects and STEM Ambassadors to celebrate the 3rd anniversary of the UN Global Goals for Sustainable Development. This annual event shall showcase interactive classroom resource activities and afford the opportunity for attendees to consider methods of incorporating global issues and children’s rights in the classroom whilst maintaining a STEM focus. MDEC are looking for teachers with a particular interest in literacy and global citizenship education. We are running a session on Wednesday 3 October from 4.30pm at our office in Victoria Street. We will discuss the use of storytelling in global citizenship education as well as what makes a good GCE fiction resource. At the end of this session, teachers will be invited to borrow books to use with their class. We will aim to meet back at the beginning of November to evaluate the resources’ success and this will inform the selection of new titles for the updating of the SIGNPOSTS website’s fiction list. This is a one-off, 2-part session although it may be repeated if there is an appetite. As always, for more information, or to discuss your school’s global learning needs, please call us on 01224 620111.